The Zodiac Sign Sagittarius Woman (November 22 - December 21), Sagittarius Personality Traits for Female born under November Zodiac signs. A Sagittarius woman is very straightforward. She is a real battle girlfriend of Robin Hood who fights for truth and justice, and always says what she thinks, even if this truth brings destruction. She often embarrasses others, believing that she is chosen to establish justice and order wherever. Sagittarius woman looks at the world without rose-colored glasses, she is not inclined to idealizing people, and even more - always doubts their good qualities, until she is personally convinced. There are very large percentage of spinsters among Sagittarius women, who have not found their man, or lost all their acquaintances because of their ambition and straightforwardness. The Sagittarius woman believes that she came into this world to make it better, and uses all her energy trying to fulfill this mission. It is very hard to please her, she meticulous and irreconcilable with errors at work. Sagittarius woman has an amazing energy, she is in constant motion, interaction with people, and a rare man of her life will endure all this fuss in his woman's life. She sincerely believes that personal life should not harm the public, and often waives it in favor of the latter. It is very difficult to convince the Sagittarius woman in something, she has a strong opinion about everything, and changes it very rarely - only when the circumstances prove to her it's wrong. This representative of the zodiacal circle does not like when someone tries to dictate or command her, but at the same time, she hates weak and weak-willed men because she is interested in those people with whom she can compete in strength and endurance. She will never be obedient to her man, and even more so - will never turn into a house wife that only cooks soups and cleans the apartment. Sagittarius woman is not a careerist, she has no mercantile expectations from life, but she needs money as necessary keys to freedom, which means she will earn them with all her efforts. This woman can easily become a true friend of men, "shirt-guy" in any male company, and very often the friendship replaces love for her chosen one. She is very proud, and will never ask for help even under critical situations, hoping only on her strength. But few people know that the Sagittarius woman is very vulnerable deep down, she can easily be offended, and even when outwardly she remains indifferent to the snide, a seething fire burns inside her, and at night she could easily cry into the pillow, just so that no one could see or hear her. It seems she easily lose her friends and breaks a relationship with her lover and then, chuckling, tells about it jokingly. But Sagittarius woman always worries deeply from such moments, and nobody will ever know how much suffering and tears her faithful pillow saw last night. Sagittarius woman can avoid personal relationships, or make it in such a way that they will not be seen externally, but alone with her man, she can be fiery, passionate and romantic. She will be happy to look after her family, because she always strives for purity and order. She is not very willing to cook, and at every opportunity, tries to take her family to a cafe, or entertain everyone with semi-prepared food. Sagittarius woman will never be able to live with a weak man for she will simply crush him with her independence. She will creatively argue and discuss affairs With a strong and equal man. It good if the Sagittarius woman and her man have common interests or work, then their attention would be directed not at soul-searching, where they often quarrel, but at the scope of work that will make them equal partners. Sagittarius woman must always be free - this is the secret of her happiness, and the happiness of her family. I love your article, you have perfected the heart of a true Sag and have my signature on this one! This is so wrong!!!! We are not stubborn in our opinions, we are in fact very open to different perspectives. Also, regardless of the fact that we can be blunt, we are loyal and caring friends so we do not ''often lose friends''. I'm offended with this article. Not a good representation of us at all!!! accurate i'm not good at cooking,and i love to go everywhere i like to,be free w/o anymore concern. I cook and have man for over 20 years. ehm, I guess a few applies... But, um, don't many oher girls/women also cry into their pillows(cry themselves to sleep)? Yup, describes me - an obstinate idiot who doesn't cook well but can eat her own food. 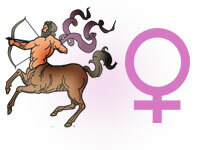 Full description of Sagittarius Woman, character traits and personality characteristic for female Sagittarius.